For the second year in a row, UVM’s student newspaper, The Vermont Cynic, has won the most coveted of national college media awards, the Pacemaker. 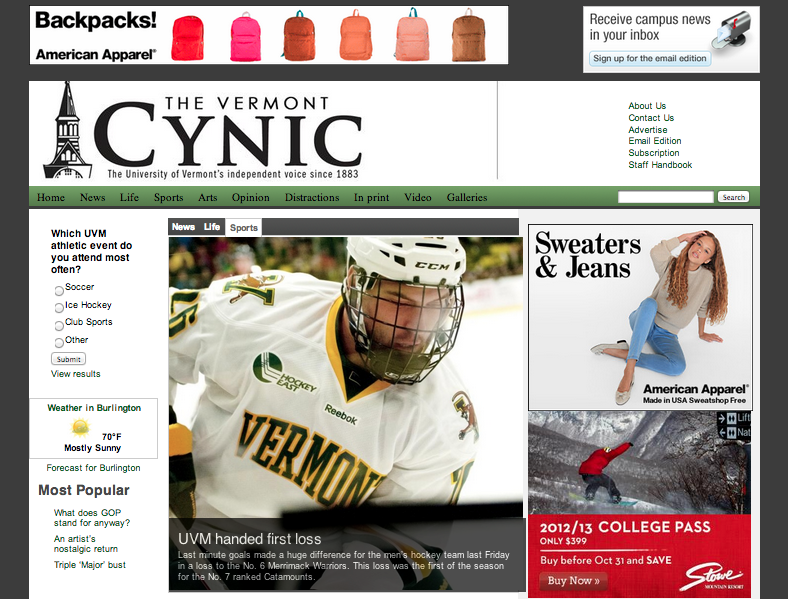 This year, The Cynic won for its online edition at vermontcynic.com; last year, the print edition took the honor. 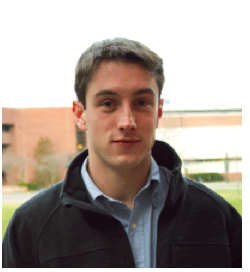 “This is a huge validation of our efforts to move into the 21st century,” Cynic Editor Brent Summers said. “When I took over as editor, the website was really shaky and we had an award-winning print edition. Pacemaker awards come in four flavors—online, newspaper, magazine and yearbook—in a contest widely considered the Pulitzer Prize of college journalism. The Cynic competed in the online category against other schools with enrollments between 10,001 and 20,000. Winning schools were University of Vermont, Yale, University of Miami, James Madison University and Duke, according to Associated Collegiate Press, which sponsors the contest. ACP reported that 55 finalists were selected out of a total of 270 entries. The contest was judged by a panel of professionals with extensive online media experience. Judges noted that the most successful sites displayed excellence in writing and editing, in-depth coverage, site design, interactivity, photography and reactions to breaking news. Pacemaker winners on the scene and on the phones: photo editor Natalie Williams, managing editor Corrie Roe, news editor Becky Hayes and assistant news editor Devin Karambelas. 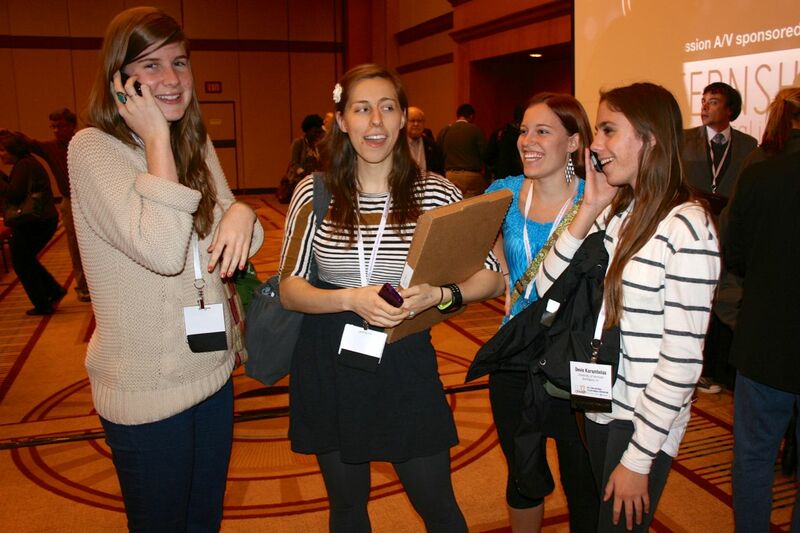 Winners were announced Saturday at the National College Media Convention in Chicago. Staff members Corrie Roe, Becky Hayes, Natalie Williams and Devin Karambelas were on hand to collect the award. Within seconds, they were calling friends and tweeting news nationwide. Tweeted Karambelas, “@vermontcynic we won an online pacemaker!!!! Not to be outdone—well, actually a couple of minutes earlier—Hayes tweeted, “WE GOT AN ONLINE PACEMAKER!!!!! Awesome job @vermontcynic :))))” She even included a picture of the award. The online award is the latest iteration of the Pacemaker, with an early version appearing in 1995 as the first nationwide competition for online college student publications. Entries are judged in March or April of each year, and all sites must be produced and maintained primarily by students, according to ACP. The Cynic website went through significant improvements between January and April, Summers said, during the brief but productive tenure of online editor Colleen McClintock. 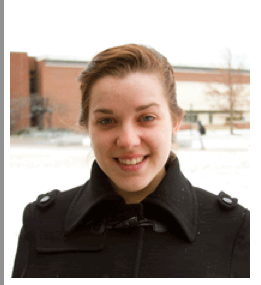 Current web editor Kathleen Murray has “been continuing Colleen’s great work and keeping the website updated,” Summers said. Though the online Pacemaker was the Cynic’s biggest award of the convention, it was not the only award. In the closing ceremonies, the print edition of The Cynic was named third best of all university weeklies at the convention, which hosted about 2,500 students from across the country.